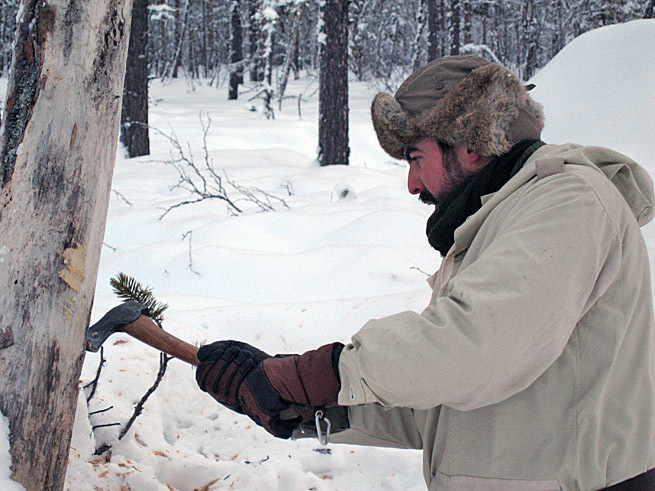 James Bath is a seasoned outdoorsman and professional bushcraft instructor. 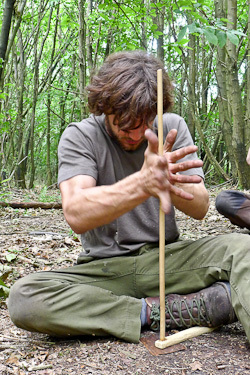 We're very pleased to announce that James Bath has joined the instructional team at Frontier Bushcraft. James joins as a Senior Instructor. James is a popular and respected professional bushcraft instructor who is already well-known to many students of wilderness bushcraft. James is one of only a few people worldwide who have been recognised by Ray Mears as a bushcraft instructor, being awarded the celebrated antler-handled Woodlore instructor’s knife. At the time of writing, this makes Frontier Bushcraft the only bushcraft school anywhere to have two instructors who have received this accolade. James and I were previously colleagues at Woodlore Ltd., after I hired James onto the staff there. James quickly proved his worth as a solid, reliable, flexible and quick-thinking team-player. This combined with his natural affinity with the great outdoors and ability to instruct and lead a group, saw him progress rapidly in his chosen career as a professional bushcraft instructor. 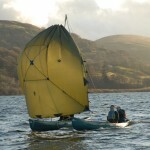 This trajectory saw James rise to the position of Woodlore's Head of Operations. Teamwork: Paul Kirtley and James Bath. Those who know James will attest to his irrepressible sense of humour as well as his utter dependability. There are very few people to whom I would trust my life. James is one of them. James and I always worked very well together and previously formed a very successful instructional partnership. We are both very happy to be working together again. About joining Frontier Bushcraft James says "I'm very much looking forward to working with Paul and the Frontier Bushcraft team again. We have spent countless weeks camped out and travelling together while working on bushcraft courses and I can't wait for the next course season." James is a key hire for us. His presence significantly bolsters our team, giving Frontier Bushcraft one of the strongest instructional teams of any bushcraft school. What all of this translates to is that, for us, James is a great guy to work with; for you, he is a great instructor to spend time with and learn from. Please leave a comment and join us in welcoming James to his new position. You couldn’t have put it better Paul. I’ve enjoyed the time James spent teaching me and he’ll be a great addition to Frontier Bushcraft. Just wanted to get my tuppence worth in and say Welcome to Frontier! I haven’t yet had a chance to participate in any of Frontiers classes as yet but hopefully in the future… Perhaps I’ll get a chance to meet everyone face to face. In the meantime, from what I’ve heard your going to be an asset to the company, so heres wishing all the very best to you and the rest of the team! Good to see you back on the Frontier website again. i asked james earlier in the year what he was doing wen he leaves and he replied that he was going to start mountain guiding!!!! i should of known he was spoofing, i cant see him doing anythin else other than bushcraft…..the crafty fox! Good to hear from you. I don’t think James was spoofing you back then. Good Luck in your new role at Frontier, James. Thanks for your support Mark. As always, it’s much appreciated. Great to hear your working with Paul again James. Think you both make a great team. 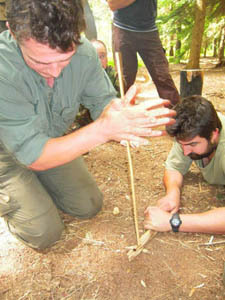 Look forward to attending one of Frontier Bushcraft courses in the new year…..
All the very best to you and the team. Thanks Stef, we look forward to seeing you again soon. I thought I recognised the name! 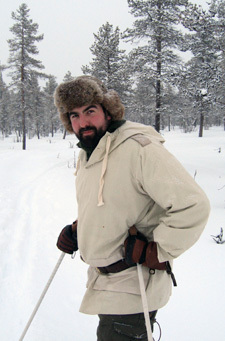 James was an assistant instructor on my Woodlore Fundamental course back in the early part of 2007. A very nice guy he was back then too, ‘though less facial hair! I would say “best of luck to you both” but I don’t think you need it. It’s good to hear from you. Thanks for your message – even though you think we might not need luck, it’s always good to have some in reserve just in case 🙂 So thanks anyway! …. and a sort of relief to me that you are working together again – such a great combination. Wishing you all the very best for what I know will be a very successful future! Thanks Chrissy, I’m really happy to have the old double-act back together again. Thanks for your kind words and hope to see you again before too long. Nice to see you’ve got a fellow cumbrian sheep worryer onboard! 🙂 Although i believe from what i’ve read, james may be a south cumbrian shandy drinking cabbage i’m a west coast marra. haha. best of luck to you all. Welcome James, great to hear you’ve joined Paul and maintained your commitment to long distance commuting!!!! Thanks for your comment. It isn’t as bad as you make out! 😉 Yes there will be commuting to courses and expeditions (as there is for all of us) but there’s no commuting to an office. We don’t have one! A laptop and a phone cuts out all unnecessary travel. It makes no sense to travel 300 miles to answer emails and sit by a phone. Wasting less time means we get more productive work done when we have to be indoors and then get outdoors more to further develop our own skills and experience. We also get to spend more time with our partners and family, which is important given how much of the year we spend away teaching and leading. These are some of the fundamental considerations around which Frontier Bushcraft has been organised. We want to really look after our people and make sure they retain balance in their life. This is not only good for them but it’s also good for our clients. The benefits to you on a course or expedition are having happy, enthusiastic, energetic, well-rounded, skilled, experienced leaders to learn from or travel with. I realise your comment was tongue-in-cheek and you probably didn’t expect a serious response! 🙂 But thanks for the opportunity to highlight this aspect of what we are about. Organising ourselves in this way makes a big difference to our effectiveness in everything we do. Wow! What a formidable team! Excellent email updates btw, Paul. I am a Frontier fan. Thanks for your comment and for your support. Glad to hear you are enjoying the Newsletter emails. More good stuff to come…. good luck to you paul,and also james.bushcraft is in safe hands,so all the best for your new ventures.phil. p.s. will james be signing up the poet to join you in the woods? . Thanks for popping over and saying hi. Hope all is going well for you at the Yorkshire School of Bushcraft? Thanks also for your best wishes. Much appreciated. Nice to hear James is joining you, he’s a really great guy (and a northerner to boot) and has taught both myself and my kids on Woodlore courses. I know this sounds strange, but as soon as I heard via the website that you were leaving Woodlore and setting up on your own and despite not knowing you personally, I made a prediction to my kids that James would eventually be joining you and sure enough !! As soon as finances allow I will certainly be signing up for a course or two. All the best to you all at Frontier Bushcraft, i wish you every success. Really nice to hear from you. It’s been a while… I hope you’ve been getting out and about plenty? Thanks for your high praise of James. I know us northerners stick together but it’s great to hear your honest, first-hand feedback. Looking forward to seeing you on a course before too long. Just wanted to say thanks for the best wishes from everyone although the one about being a southern cabbage stung a little. See you in the woods soon!